Home / Blogging and Admin / Events / Personal and Misc / Travel and Living / My Notes from "How to travel the world on budget" Unconference! 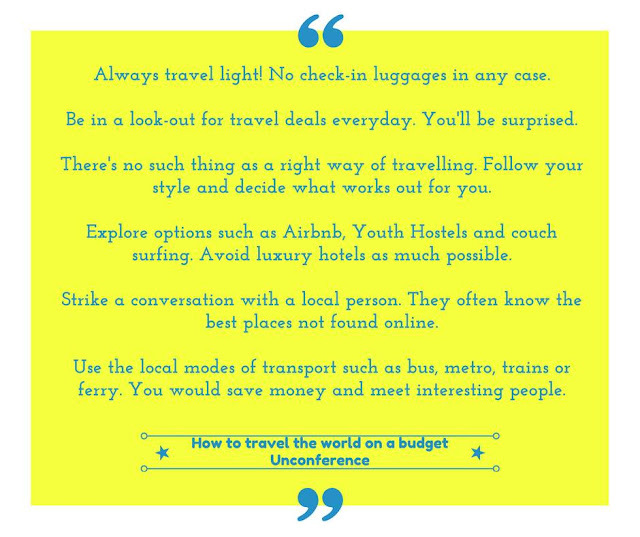 My Notes from "How to travel the world on budget" Unconference! 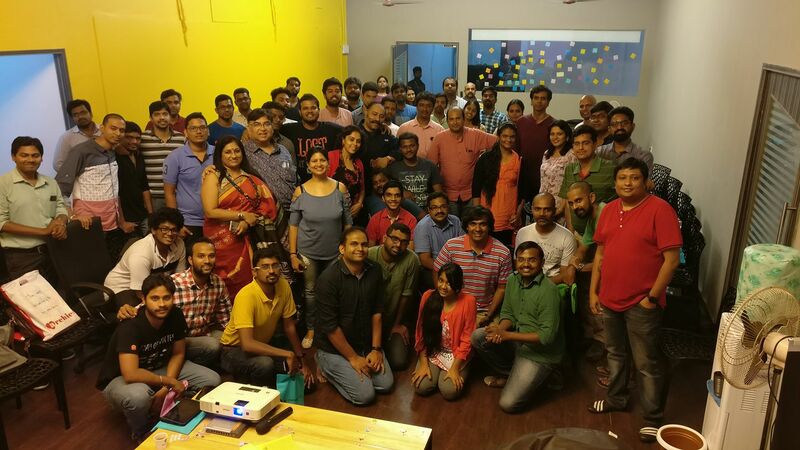 A week ago, I attended an unconference in Chennai about “How to travel the world on a budget”. The unconference was conceptualized and run by none other than Kiruba Shankar, who is the pioneer behind the concept of Unconferences. ('Unconferences' are where there’s no designated speakers and stage- every participant gets equal opportunity as a speaker to put his/her thoughts forward, taking away monotony of a conference and inducing live interactions). This particular unconference on budget world travel received huge response with over 320 people registering whereas the venue (offered by NotionPress) had seating capacity of only 60. This sort of proves there’s lots of scope for Travel industry and related activities/services. Though unconference adopts a free flow concept, few individuals with relatively higher expertise/experience are often invited to trigger the conversation and feed in their expert inputs. In this unconference on “How to Travel the world on Budget”, Sanchin Bandari (CEO of Eccentrips), Ansoo Gupta (CMO, Pinstorm), and Chari Vijayaraghavan were key speakers. I was also invited to share my thoughts and tips from the perspective of “traveling the world without quitting your job” perspective. In this post, I am trying to summarize the tips and ideas that came out of the unconference. Part of it is summary of what I spoke, rest are tips from other speakers/audience, as much as I could recall from my memory + few points borrowed from members of the audience who were quick to note them down and share it online. If you couldn’t attend the session, I am sure these notes will help you motivate yourself and plan your travel better. Kiruba opened the event with one of his signature ice breaker activity. My talk at the “How to travel the world on budget” unconference. Most of us talk about willing to travel, but if we introspect deep, travel will be at the bottom of our priorities. We want to spend on party, shopping, gadgets etc and claim we have no money for travel. We expect a dozen things fall in place (leave, cheap tickets, friends/family being free to join us etc etc) for us to travel, else claim we don’t have time to travel. One simple and key requirement for being able to travel a lot is your ability to put travel above rest of luxuries/activities. Once you prioritize travel and set a target (like I will visit min 2 international cities in 2017 or I will explore at least 5 Indian states I haven’t been to so far) then arranging time and resource and putting a plan becomes easier. If you never prioritize it then it will be in the side-line, like how most of us plan to go to Gym regularly on new-year eve. I gave the example of a drunkard, who somehow manages to get 100 Rs to go to TASMAC bar every evening. His single most priority in life is to get drunk that evening and somehow he will find time and money for it, even if it means beg/borrow/steal or beating his wife. In other words, prioritize travel above other luxuries/activities and let us see why is it that you can’t travel. Most of us claim we don’t have the money to travel or wonder how someone is able to travel so much. It is not impossible to save some funds for travel, even with a limited salary. If you notice carefully, those who travel a lot with their own money usually cut down on various other luxuries and unnecessary spends. In my case, I have stayed away from buying a car, I live a very simple everyday life- I use a bike/public transport to go around, I don’t indulge in luxury shopping, gadgets, eating out etc- these activities can easily cost several thousand a day and go unnoticed. Either avoiding or reducing the frequency/amount spent on these can easily free up lots of money for you which can then be spent on travel. For more details read these 2 posts of mine- How I save for my travel- guest post on Payaniga and Skydiving at 30k- is it really expensive? 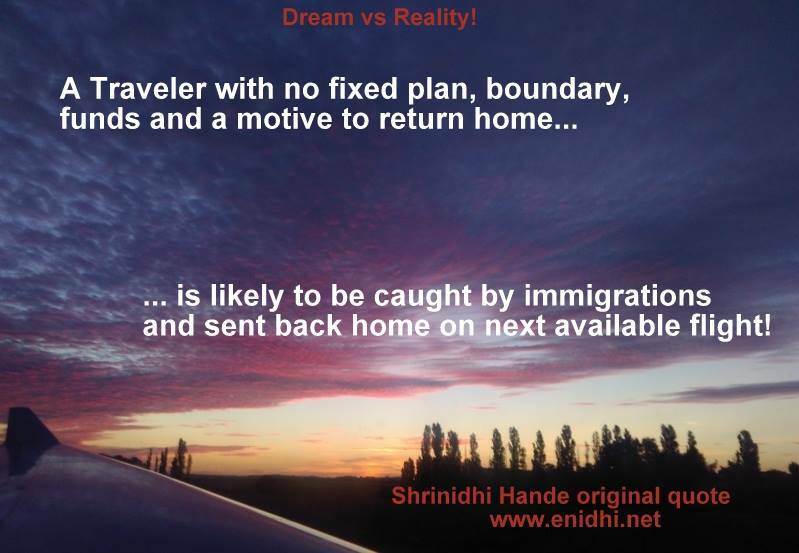 If you can’t compromise on any of the everyday luxuries and still want to travel the world first class, there is no magic formula- either you should have a rich father or father in law. Air Tickets- Look for Airline sales, during which tickets are usually cheapest. Check this post for Air Asia Big Sale hacks. On every flight a few seats are sold for a very cheap fare- if you can grab those ultra-low fare seats, your travel cost is guaranteed to be anywhere between 30 to 60% cheaper than normal airfares. These low cost tickets on low cost airlines come with lots of riders like no refund etc, as risk you need to take. Taking risks: Many of us want to confirm a dozen things before we book- if I will get leave, if my spouse is free to join, what will be parents say, if any of my friends are likely to join etc etc. If you wait for all those confirmations, the cheap fare will be gone. And even after you take all those confirmation and book, there is no assurance that something will not go wrong 2 days before the trip forcing you to cancel the trip. So my approach is to book when it is cheap and hope that I will be able to travel as per plan. There is a small risk that I might have to cancel and lose 100%, which is a gamble I am willing to try. Hotels: Websites like Booking.com offer free cancellation, reducing risks. AirBnB like accommodations often give very unique experiences at reasonable prices. Hostels, couch surfing and camping are other cost saving ideas to explore. Managing leave: My trips are usually booked months in advance so that I can plan around it. I do carry office laptop and work a bit on holiday if situation demands. And if my presence is critical at office, I do cancel my trips. Most of my trips are planned around long weekends so that I don’t have to take too many leaves. [Check my 2017 Long weekend calendar here to plan your trips]. I travel mostly on my own, but am fortunate enough to get a few trips on invitation from travel and hospitality brands and occasionally on work. While my trips are usually short, next to speak was Sachin Bandari, who has travelled for months at a stretch, exploring interiors of Latin America and more. He shared some visa tips and tricks and shared his experience fighting at local festivals, learning Salsa in Argentina and more. His experiences are well documented on his company, Eccentrips. He said he is renting one of the rooms of his house in Mumbai on AirBnB and earns about 30k from it every month. Ansoo Gupta talked about traveling light, particularly for girls. She says she avoids check-in bag at all costs. She doesn’t carry too many sets of cloths, shampoos and other accessories and managed to travel light. This is great tip to follow- we should all travel light. But sometimes my camera bag and office laptop together exhausts cabin bag weight limit of 7kgs. I try to avoid check-in bag where I can, but sometimes there is no escape from it. Ansoo also said she feels Ixigo, Akbar Travels and Skyscanner are the best spots to get cheapest fares and deals. Ansoo conducts travel workshops on her own and was keen to conduct one in Chennai. Ansoo also promotes responsible travel. Kedar Nath, who has biked 13 countries covering 18000 kms was also present at the unconference- he talked about his journey and how his employer (JSW) have been supportive of his initiatives. He managed to get paid leave for his trips and in exchange got lots of publicity for his employer’s brand. He has written a book on his experiences and is currently gearing up for one more cross country bike trip. Read his interview on YourStory here. Sangeetha shared her experience traveling solo, seeking direction from strangers and dealing with men trying to get her WhatsApp number while pretending to help. Another girl spoke about how villagers in report areas of Indonesia came together to help her and take her to faraway hospital as she fell sick while trekking. Kiruba talked about Japanese students volunteering at his farm. Chari Vijayaraghavan was next to speak. He is associated with The Hindu and has lead the Young World Club initiative. Having travelled to 70+ countries, Chari had lots of experiences to share on volunteering, exploring places ranging from North Pole to Antarctica. He showed his backpacking itineraries, cost comparison when you travel as a volunteer, student or a tourist and so on. Instead of budget travel, Chari proposed value for money travel- some of the trips he suggested cost several thousand dollars, but are totally worth it and are once in a lifetime experiences. Being able to save up for such trips, managing to find a right deal and being able to execute it as per plan will be on the top of every traveller’s wishlist. He said being able to work as a Nanny (caretaker for kids) is a lucrative travel opportunity for people from Asia. If you know good English, have skills like Yoga etc, or willing to work as animal caretaker etc you can take up paid/unpaid volunteering work, earn some cash or at least have your stay and food experiences covered while also getting to explore new countries. He is vegetarian by food habit like me and didn’t find it inconvenient to survive while abroad. Peshwa Acharya, who heads Sterling Holidays shared his thoughts as someone who travels for work all the time and works on the other side of the mirror- running a luxury holiday business. He said he deals with physical travel agents than booking online- this gives him longer credit periods, better cancellation deals compared to OTA (online travel agents like MMT). Several members from the audience also spoke their experience and shared their tips and ideas. Unfortunately I am unable to recall the names and details. Visas: Begin exploring countries that give Visa on Arrival or ETA, to reduce visa costs. Get US Visa- which enables visa free entry to many more countries. Do not assume everything will go smooth. Though Indians are expected to get visa on arrival in some countries, there could be secondary restrictions- like cash, onward tickets, whether entering via US or not etc. Do carry physical evidence of visa on arrival etc. There are some websites that give valid onward tickets for USD 10, valid for 24 hours (after which it will be cancelled automatically)-but trying to trick the immigration with these can cost you dearly if caught, including imprisonment and deportation, so not recommended to mess with Visa rules and guidelines. It was nice meeting Pravin Shekar and many others at the event. Many aspiring travelers and bloggers connected with me post even seeking tips and advise- I did to the best of my abilities, hope they found it useful. Were you at the conference? Did I miss any key points? Do let me know. Overall it was Sunday evening well spent- my phone was in bad shape so didn't take any photos but was good meeting so many likeminded people and exchange ideas. Thanks to Kiruba and volunteers for making this unconference happen and thanks to NotionPress for providing the venue. @Divya- great- yes, custom itinerary is often cheaper and more fulfilling. Valuable tips for budget traveling . Good tips!! Based on my experience, I agree with the points you mentioned.